Why did I go to San Francisco? I guess this was one of the reasons: climbing a hill that's higher than any point in the state of Florida. Ideally, I enjoy experiencing new-to-me cities as an enthusiast, not as a tourist. I immerse myself in the culture, eat the local food, talk with the local people. That's what I did in New Orleans, and it was one of the best vacations I've had. But when you're traveling with someone who doesn't share your approach, compromises must be made. 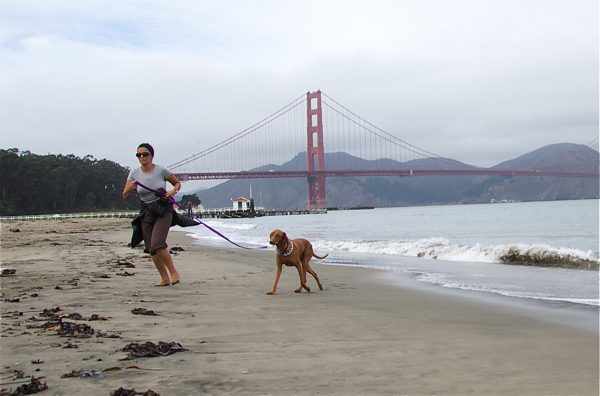 My recent trip to San Francisco and Napa Valley was one big compromise. But my New York friend and I did stay in a sketchy motel on the intersection of Polk and Ellis streets, which made me happy. Some of the most enjoyable aspects of a big city can be found its doldrums. You meet real people in these areas. After getting off the subway train, I walked through the area around City Hall. It's as pristine and presentable as any city's government district. But as I approached the motel, which was only a matter of blocks from City Hall, there was a visible transition into the seedy part. The sidewalks no longer were clean. There were bums and boozers. And it was loud. "I wouldn't want to live here," a cab driver told us. He said there was a lot of drugs - cocaine, mostly - in that neighborhood of San Francisco, known as Tenderloin. I didn't have a problem with drugs, but I was kept up most of the night by noisy fellow motel patrons yelling at each other, undoubtedly drunken, high or otherwise liberal. No harm, though. I got enough sleep to enjoy my first experience as a true tourist. In an idea I would've never gotten myself, my friend signed us up for a Segway tour of the city - beginner's version, of course. 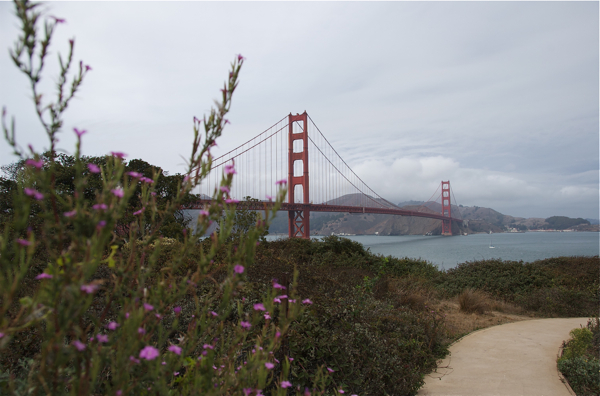 As we waited for the next available spots on the tour, we walked along the banks of San Francisco Bay, gawking at the main thing there is to gawk at: the Golden Gate Bridge. That's why most of the photos from Day 1 consist of that big red transportation facilitator. As a hill-deprived converted Floridian, I couldn't believe the drastic inclines citywide. There were several points throughout the 4-mile trek that were higher than the highest point in the Sunshine State, 345 feet above sea level. 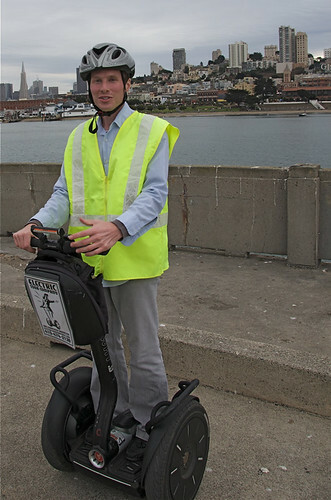 When the Segway tour started, my feet were soar and in no shape to do more walking, so I began to think my friend was onto something with this motorized tourism concept. But first, we had to sit through a training video on how to use a Segway, then go through actual training - weaving between cones, backing up, stopping, getting off - all in the parking lot of the place that charges $70 for a "tour" of the city. I didn't want a class; I wanted to see things. But using a Segway isn't as simple as it looks. It requires balance. Even the slightest movement adjusts your course. After a few minutes, I had a handle on it, and we struck out for the city. 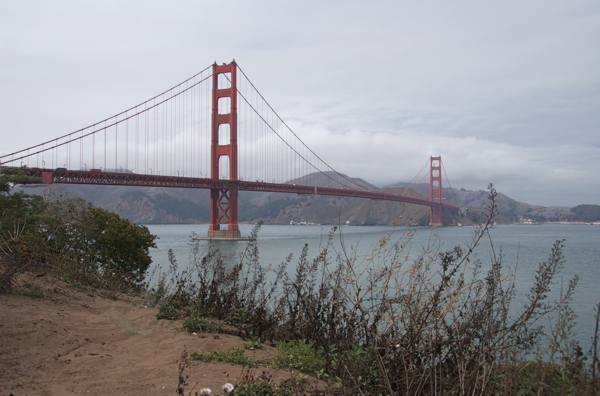 It would figure that the first chunk of the tour took us on the route of our walk along the bay. But the last portion went through North Beach, a section that was actually a beach long ago but is now miles from the water. Seeing the old neighborhoods was a treat, but another aspect of the Segway tour was truly a first for me: I was the tourist attraction. There's something about seeing a group of 15 people driving Segways and clad in bright-yellow vests that makes tourists feel the need to take a photo, wave and stare. It was especially bad because we were speeding through the tourist-laden areas - places such as Pier 39, where the restaurants and shops catered to people like us. What's so great about this, anyway? 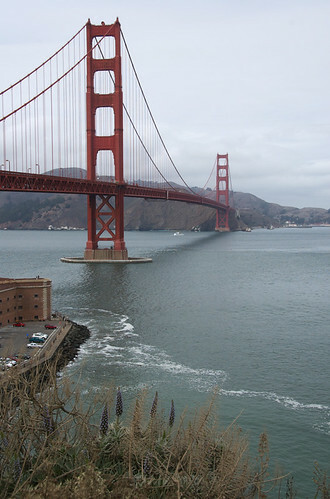 Is this the real San Francisco? Where's the Rice-A-Roni? The cable cars? Nancy Pelosi? But it didn't matter. Driving a Segway was just fun. And I guess that's the main reason I came to San Francisco. 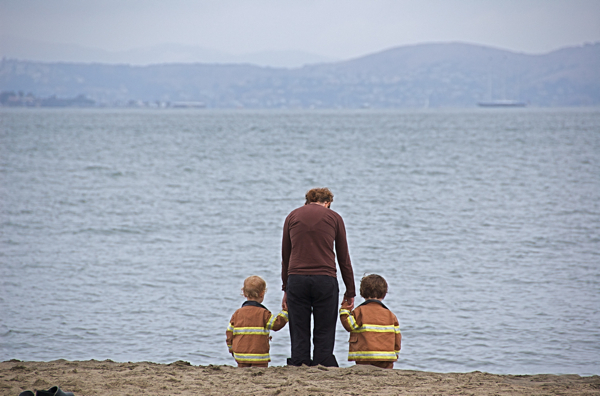 Apparently, young San Franciscans are big on firefighting. Yep, Day 1 was consumed mostly with a bridge. 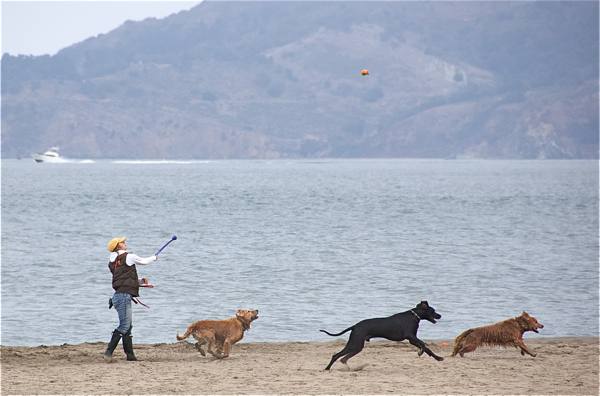 San Francisco Bay is definitely a place for the dogs. Wouldn't want to be in a house with those animals after this. This is the closest we got to the bridge until we drove across it later in our stay. The photo was taken at a popular viewing area, where a boatload of tourists - literally; they were on a cruise - was also snapping photos. It got to a point where my friend and I were getting asked to take photos of the touring couples so frequently that we just wanted to leave. So we did. 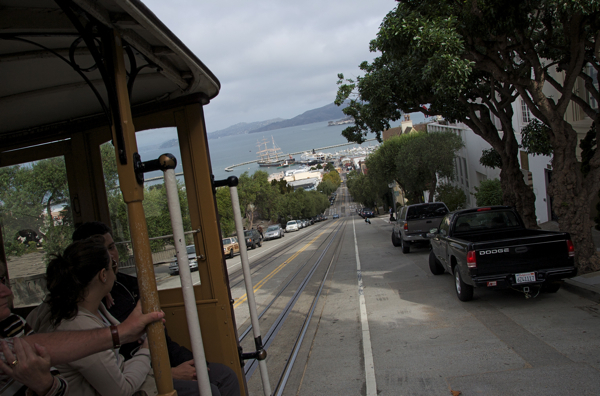 We caught a free ride on a cable car to the waterfront. I guess this is another reason why tourists visit San Francisco. hahaha I love the pic on the segway! To blend in more next time, don't call it the subway, refer to is as the BART. I've never done the Segway thing. Looks like fun. I was going to, Jill, but I just didn't feel like spelling it out. The Segway thing was a blast. How were your feet after walking?? I love the cable cars. When my mom and I visited in the 90s, we only took the cable cars to get around. Did you ever watch one get turned around at the end point? I'm jealous that you got so close to the bridge. That and visiting Alcatraz were things we didn't do. But I could see the bridge quite nicely from a restaurant as the sun was setting. I stupidly wore my loafers for that stroll. Not exactly nicely padded walking shoes. My feet felt as though they might fall off. I didn't have the pleasure of seeing a cable car get turned around. Next time!